Do You Procrastinate? Do you start projects that are important to you, but then abandon them? 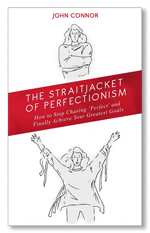 Like so many, you probably have internalized perfectionism without even realizing it. You have big dreams, great goals that you keep secret because you don’t want to be embarrassed if you fail at them. You have been told – and it’s true – that if you don’t at least attempt to reach for your desires, you cannot possibly achieve them. But even knowing that hasn’t helped you. Great news! This book is for you. It will help you climb over the mountain of doubt and shake yourself free from procrastination paralysis. How do I know? Because I’ve done it. This short book does triple duty: In it I’ve shared not only my own experience with trial and error, and experiences from people I have coached, but also solid research about perfectionism anchored in current psychology.